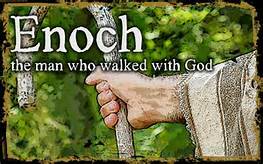 Enoch was an integral part of Gods plan and was essential in completing his mission here on earth as a preacher, teacher, and prophet of God! He was seventh in line from Adam and became a legendary figure in apocalyptic literature. His father’s name was Jared who was one hundred and sixty when Enoch was born then went on to live another eight hundred years and passed away at nine hundred and sixty two. (Genesis 5:18-20). Many of us know that Me-thu’-se-lah was the oldest person to of ever lived, and Enoch was his father who begat him at the age of sixty five. Enoch went on to live another three hundred years having lived a total of three hundred and sixty five years which seems a short time compared to His son Me-thu’-se-lah who had tripled his years and lived to be nine hundred and sixty nine years! (Genesis 5:21-27). And Enoch lived sixty and five years, and begat Methuselah:And Enoch walked with God after he begat Methuselah three hundred years, and begat sons and daughters: And all the days of Enoch were three hundred sixty and five years: And Enoch walked with God: and he was not; for God took him. And Methuselah lived an hundred eighty and seven years, and begat Lamech. And Methuselah lived after he begat Lamech seven hundred eighty and two years, and begat sons and daughters: And all the days of Methuselah were nine hundred sixty and nine years: and he died. Enoch’s life was very different compared to others as he was one of only two people that was not buried among men on earth, but was translated straight to heaven and the other being Elijah who was taken up in a whirlwind seen before Elisha! (Genesis 5:24) And Enoch walked with God: and he was not; for God took him….. (Hebrews 11:5) By faith Enoch was translated that he should not see death; and was not found, because God had translated him: for before his translation he had this testimony, that he pleased God. Enoch prophesied the Lord will come with ten thousands of His saints, and that judgment would ensue over the ungodly. (Jude 1: 14-15). We see in revelation his prophesy does come to pass. (Revelation 7:9-10) After this I beheld, and, lo, a great multitude, which no man could number, of all nations, and kindreds, and people, and tongues, stood before the throne, and before the Lamb, clothed with white robes, and palms in their hands; And cried with a loud voice, saying, Salvation to our God which sitteth upon the throne, and unto the Lamb……. (Revelation 5:9-10). For those who truly love the Lord we are not literally but are spiritually translated into the kingdom of God, for we are redeemed by His blood and are delivered from the power of darkness. (Colossians 1:12-17).